It's beginning to feel a lot like wedding season! I will be attending the wedding of two high school sweethearts at the end of this month, so I definitely have wedding pomp and circumstance on the brain. 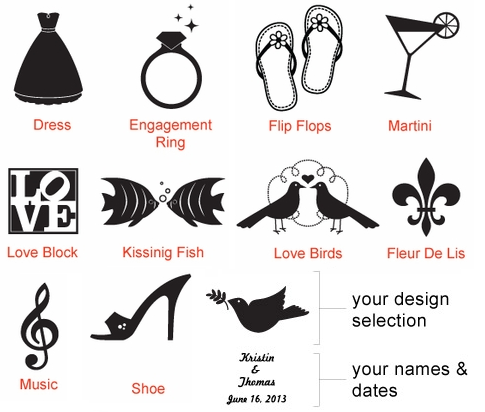 Back in March I wrote about what to wear to a wedding, and now the Muse brings you some ideas on how to decorate for a wedding using personalized glassware. You don't want to be tardy for this wedding (sorry, I couldn't help myself). Personalized wine and champagne glasses always make for elegant wedding favors because you can use them during wedding party toasts; they can decorate the tabletop; they add variety and creativity to the overall affair; and they are valuable parting gifts. People remember weddings because of the bride's dress, the food and the toasts. 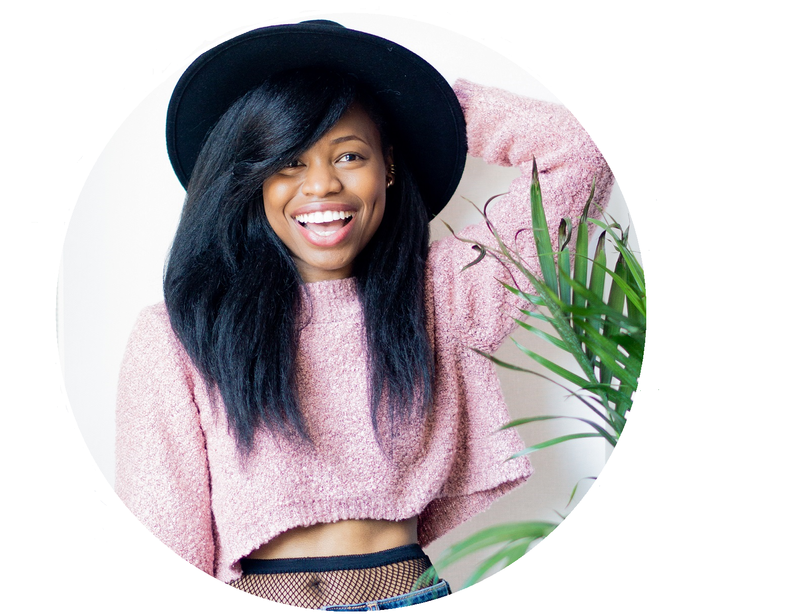 Whether you have a crazy aunt who wants to reminiscence about how cute you were as a baby, or a college friend who can only remember the 3 AM hangover sessions you shared, wedding toasts provide your guests with fun memories. 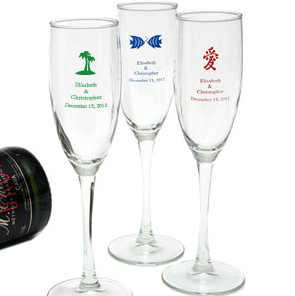 So why not keep that memory going with a personalized champagne flute where you can add particular images or phrases that are specific to your guests. If you've ever seen an episode of Four Weddings, then you know that people can get testy when you don't stick to your wedding theme. A good way to keep the theme alive is to incorporate it into your glassware decorations. Reinforce your beach wedding, high school sweethearts or Halloween theme by adding an image to your glasses in any color of your choice. American Bridal allows you to personalize your drink decor with both words and images that coordinate with your event's overall theme. 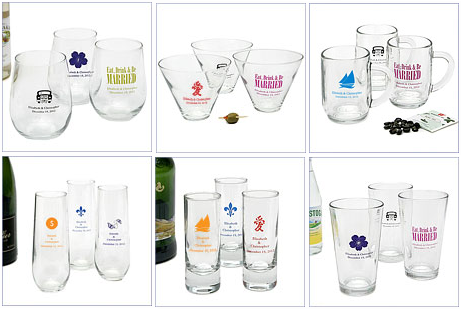 The fact that the personalized glassware comes in so many varieties means that you can use these for any event or gift giving ceremony. Stemless wine and martini glasses are stable, unique and perfect for a summer blogger meetup or fashion event. 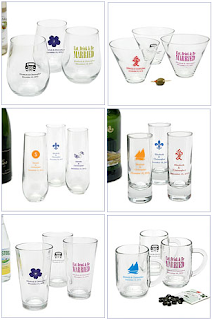 Personalized shot glasses and mugs make for cool gifts for guys that also can be tailored to their interests. After your wedding ceremony or event, the best part about these is that guests will actually want to take them home. It will be more likely that a guest will treasure this keepsake when it is engraved with not only information from your event, but also something personal about them. Because what's better -- a favor that says "Jack & Sally's Wedding" or one that says "Cheryl Rocked It At Jack & Sally's Wedding"? Yeah...no contest. 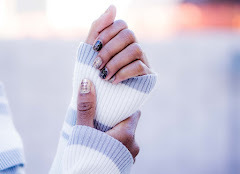 Remember to enter the Just Jen Giveaway to win a custom blog shirt! I love this idea. It's true that something like this will be treasured more by the guests. Those mugs are really cute. 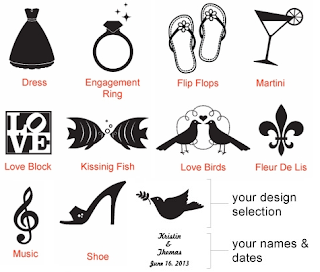 Personalized items are great and make for great gifts too! Enjoyed this! I haven't watched Four Weddings yet, I think it is showing here in SA though. I want it. I like personalizing everything because I like seeing my name everywhere. BONNIE. i like this idea for gift giving at weddings!! or even for 'save the dates'! Great suggestions!! I am already amrried and we made all the possible mistakes! i love personalized items. these are perfect for gift-giving, and for me, of course. have a great day, c! I love the personal glassware idea. I love wedding season, seems like each year I've been attending them. One this year so far. what a super fun idea! 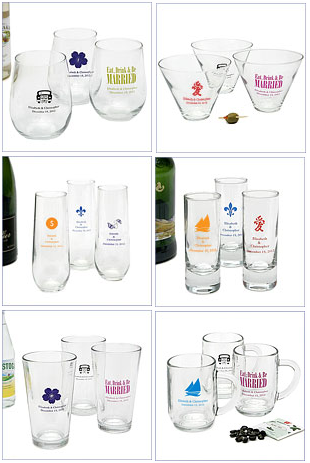 Love the idea of personalized glassware as wedding favors. One thing in your post really rings true, people do get edgy if you deviate from the wedding theme. These are such a good way to extend the theme, with such convenience.